So you’ve set your New Year’s Resolutions (or New Year’s Goals) and now you’re all gung-ho to do better this year. And maybe, just maybe one of your goals is to finally start that compost pile you’ve been meaning to start. I mean, what’s not to love? It reduces the ‘smell’ in your kitchen trash can because food’s not sitting in there for several days. And it makes compost. COMPOST! You know, the stuff you typically drive to the store and plunk down your hard-earned money to buy in a big plastic (ugh) bag and then schlep home. Your gut feeling is right – making it yourself is cheaper, uses your kitchen waste and DOESN’T come entombed in plastic. All the way around, good for the environment, good for your garden and good for your budget #amiright??! 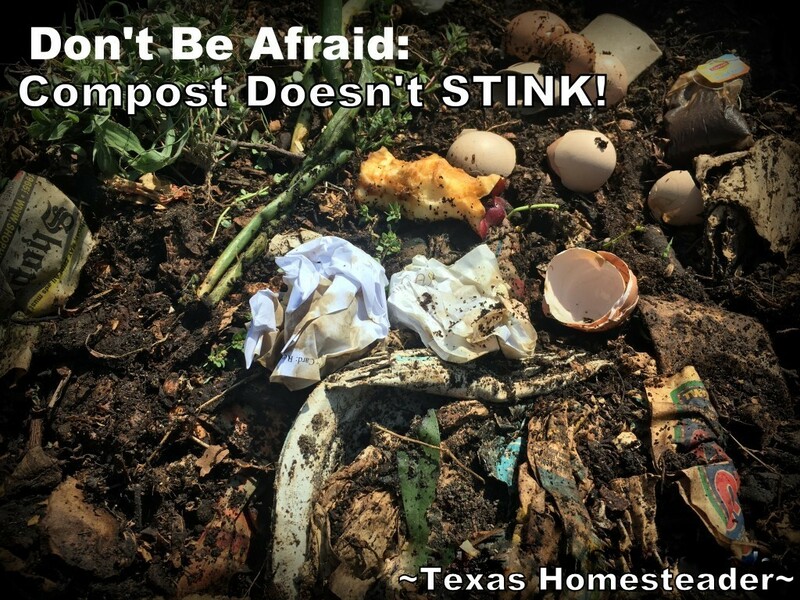 But you newbie composters may worry and think to yourself “If you’re rotting food scraps, doesn’t that stink?? !” Well worry not, dear readers. Today’s Throwback Thursday post brings that popular post back to the surface to ease your mind. Check it out! This entry was posted in Blog Posts and tagged Throwback Thursday on January 26, 2018 by Texas Homesteader.